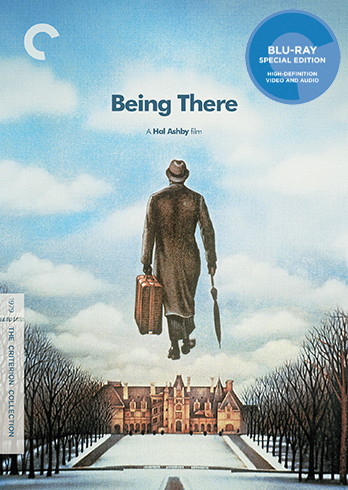 Blu-Ray Review | "Being There"
After the death of his beloved employer, known only as "the old man," a simple-minded gardener named Chance (Peter Sellers) is thrust out into the world, his only knowledge of life outside his garden coming from the television programs he watches religiously. After her limo accidentally backs into him, he is taken in by Eve (Shirley MacLaine), the wealthy wife of well-connected businessman, Benjamin Rand (Melvyn Douglas, who won an Oscar for his performance). The Rands mistake Chance's childlike naivete for profound insights into life and politics. Benjamin, who is dying but is a close friend and adviser to the President, introduces Chance to the Commander-in-Chief, and soon his musings are gardening become the cornerstone of the President's economic policy. Chance unwittingly becomes a national celebrity overnight, as his simple outlook on life turns into a refreshingly uncomplicated philosophy in a world obsessed with political intrigue, drama, and detail. Much like its lead character, Hal Ashby's altogether wonderful Being There, out this month on Blu-Ray from The Criterion Collection, is something of a blank emotional slate onto which the audience can project its own feelings. Chance is essentially a child, probably somewhere on the autism spectrum, uneducated and illiterate, yet he stumbles into the halls of power almost without question from the powers that be. He becomes a "flavor of the moment," and America becomes willing to give the keys to the kingdom to a man who is wholly unqualified and without the proper understanding of how the government, or the world in general, works. Sound familiar? 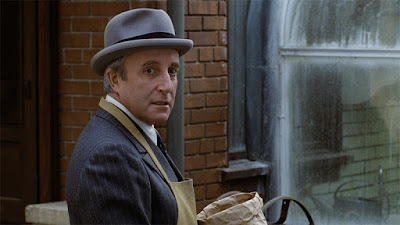 In that regard, Being There feels eerily prescient (at the time it was interpreted as a comment on the rise of Ronald Reagan...oh how far we've come). It's also a comment on race in America that still rings true today. "It's for sure a white man's world in America." exclaims Louise, the black maid who raised Chance, and is the only one who knows who he really is. "Look here: I raised that boy since he was the size of a piss-ant. And I'll say right now, he never learned to read and write. No, sir. Had no brains at all. Was stuffed with rice pudding between th' ears. Shortchanged by the Lord, and dumb as a jackass. Look at him now! Yes, sir, all you've gotta be is white in America, to get whatever you want." There's a lot to be said for Being There's commentary about the ease in which Chance rockets to unwitting (and unearned) political stardom, but he is certainly no Donald Trump. There's no malice in his actions, no intent to deceive or lie to anyone. He simply doesn't understand what's going on around him, while everyone else ascribes whatever they want to his vague pronouncements. There's a kindness and sense of childlike wonder about him that really gives the film its sense of charm. In fact, by the end of the film, Ashby has turned chance into a kind of Christ-like figure, as he literally walks on water in the film's final shot. In that regard, Chance's rise to prominence is not necessarily meant to be a bad thing. He opens people up, and connects them with a simpler, less complicated view of life, which humanity in all its wisdom has turned into a series of neurotic political maneuverings. "Life is a state of mind," goes the final line of the film, and indeed, Being There seems to have little use for those who unnecessarily complicated with needless concerns and made-up human dramas. Therein lies the real beauty of the film - Chance's rise is both positive and negative, bringing out the best and the worst of human nature. Whether or not his influence is good or bad is never really explored, and ultimately left up to the audience. Ashby wisely places the ball in our court, leaving us to interpret it as we will. It's both a critique of a world that allows such a man to achieve such a prominent role in American leadership (where even the most unqualified of white men is allowed to soar to the top of the food chain), and a celebration of his good-natured, completely non-cynical outlook, standing apart from the high-speed neurosis of modern American life. Being There is, like Chance, whatever we want it to be. It's a beautiful enigma (given life through Caleb Deschanel's evocative cinematography, gorgeously rendered on Blu-Ray), both heartwarming and melancholy - a film that has gone on to influence such films as Rain Man and Forrest Gump. Yet it has somehow stands apart in its refusal to sentimentalize its story. The result is something magic and otherworldly, a film that closed out the 1970's with a knowing smile, mourning that which was to come, and celebrating an unassuming antidote to the decade's increasing sense of materialism and political polarization. And it feels more essential now than ever.